The Players Club is a membership program valid at Meadowlands Racing & Entertainment and Winners at Bayonne. Membership in the Players Club is open to legal residents of the 50 United States and the District of Columbia who are eighteen years of age or older. Employees, and their immediate families of NMRLLC or Sodexo are not eligible. By joining the Players Club you represent that you are of legal wagering age in and a legal resident of your state or district of residence and that you agree to the terms and conditions of the Players Club. Your Membership is valid only at participating properties. Your Membership is nontransferable and is subject to current and future Players Club rules. One membership and one membership card per person. Members are in no way permitted to share their card with other members or non-members. Members may not combine points earned by other members in the Players Club or transfer, sell or otherwise dispose of points in violation or attempted subversion of these terms and conditions. Failure to follow this policy will result in automatic termination of the member’s account and forfeiture of any accumulated or earned Players Club points. Any other privileges associated with your Membership will also be revoked without exception. For example, Pennsylvania tracks have high takeout rates and charge us lower fees so we earn more money on wagers made than we would on New York tracks that have low takeout rates and charge us higher fees. Therefore, a player is likely to earn a higher percentage rebate on Pennsylvania tracks than on Kentucky tracks. A complete chart is available, please click here. Players Club members can have their wagers recorded in one of two ways—by handing the Club Card to a teller prior to wagering, or by swiping the Card at a Self-Service Terminal prior to wagering. After wagering, players should always check their tickets to ensure their wager has been recorded. If the wager has been successfully recorded, the player’s Players Club account number will appear at the bottom of the ticket. Players Club members can redeem their points at any Players Club kiosk located at Meadowlands Racing & Entertainment and Winners at Bayonne. Click here to view the prize list. 1. How do I join the Players Club? Is it free? Players Club membership is free. 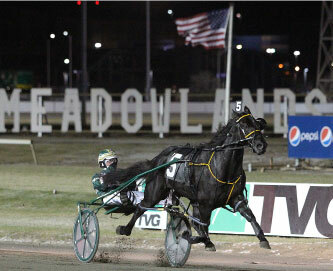 You can sign-up at Meadowlands Racing & Entertainment or Winners at Bayonne. 2. How does the club work? Once enrolled, you'll receive your own personal Players Club card. This card is your passport to club benefits. Present your card to the mutuel clerk, or into the self-service machine each time you wager. Every time you wager with the Players Club card, you will earn points towards great prizes and rewards. Please stop by any guest service location at Meadowlands Racing & Entertinament or Winners at Bayonne to receive a new card. Your accumulated points and any pass privileges will be transferred to a new account. Your old card will be deactivated. 4. Does using the card slow down the wagering process? No. It only takes one second for the mutuel clerk to insert the card into the reader and automatically record your wager. 5. Is my account confidential? All information pertaining to your account is strictly confidential and is not available to any other companies, partners or third-party vendors. 6. May I share my card with family or friends? No. Each member is expected to have an individual Players Club card. 7. When do points get added to my account? Points will be added the day after your wager is placed. 8. Do my points expire? Yes. Points expire if your account is inactive for 6 months. 9. How do I check my account? To check your account, simply sign-in to your Players Club account at BigMClub.com. Click "Sign-In" on the main page. Type in your account number in the designated field, and type your PIN # in the designated field below it. Then, click "Sign-In". All of your account information will be available on the following page.